﻿ Luxury China Silk Road Tours, Silk Road Packages in China! Begin your China Silk Road cultural adventure in Xi'an and end at Kashgar in Xinjiang. Visit the Mogao Grottoes in Dunhuang and discover ethnic cultures dispersed along the the Silk Road route. Explore Kashgar's legendary markets with irresistible silks and jewellery. The diversity of the Silk Road is always a highlight for any traveler, and we offer a range of tours for all requirements. 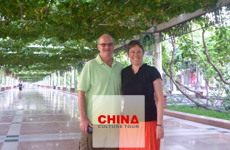 Solo travelers, family groups or seniors will be mesmerized by silk road culture and we offer tours to meet all specifications. Beijing (3-5 nights): Temple of Heaven, Summer Palace, Forbidden City, Hutong, Mutianyu Great Wall, Peking Opera, Chinese Kungfu, Peking Roasted Duck, etc. Xian (1-2 nights): Museum of Terra-Cotta Worries, Big Wild Goose Pagoda, Ancient City Wall, the Mosque, Forest of Stone Steles Museum, Shaanxi History Museum, Chinese Noodle and Dumpling, shadow play, Tang Dynasty Music and Dance Show, etc. Urumqi (1-2 nights): Erdaoqiao Bazaar, Heavenly Lake, Southern Pasture, Xinjiang Museum, etc. Kashgar (2-3 nights): The Id Kah Mosque, the Old Street, the Abakh Khoja Tomb, a local kindergarten, Zhiren Street, Kashgar Bazaar - Kashgar Live Stock Sunday Market, etc. Beijing (3-5 nights): Tiananmen Square, Temple of Heaven, Summer Palace, Forbidden City, Jingshan Park, Hutong, Mutianyu Great Wall, Yonghegong Lamasery, Confucian Temple, Peking Opera, Chinese Kungfu, Peking Roasted Duck, etc. Xian (1-2 nights): Beijing to Xian by air, Museum of Terra-Cotta Worries, Big Wild Goose Pagoda, Ancient City Wall, the Mosque, Forest of Stone Steles Museum, Shaanxi History Museum, Chinese Noodle and Dumpling, shadow play, Tang Dynasty Music and Dance Show, etc. Lanzhou (1-2 nights): Xian to Lanzhou by air, Yellow River, White Pagoda Park, Zhongshan Iron Bridge, Gansu Provincial Museum, Waterwheel Garden, Bingling Temple Grottoes, etc. Xiahe (1-2 nights): Lanzhou to Xiahe by car, the Sangke Prairie, Labrang Monastery, etc. Dunhuang (1-2 nights): Lanzhou to Dunhuang by air, the Mogao Grottoes, Echoing-Sand Dune and Crescent Lake, camel riding, etc. Turpan (1-2 nights): Dunhuang to Turpan by air, The Ancient City of Jiaohe, the Karez System and the Sugong Pagoda, etc. Urumqi (1-2 nights): Turpan to Urumqi by fast train, the Erdaoqiao Bazaar, Heavenly Lake, Southern Pasture, Xinjiang Museum, etc. Kashgar (2-3 nights): Urumqi to Kashgar by air, the Id Kah Mosque, the Old Street, the Abakh Khoja Tomb, a local kindergarten, Zhiren Street, Kashgar Bazaar - Kashgar Live Stock Sunday Market, etc.